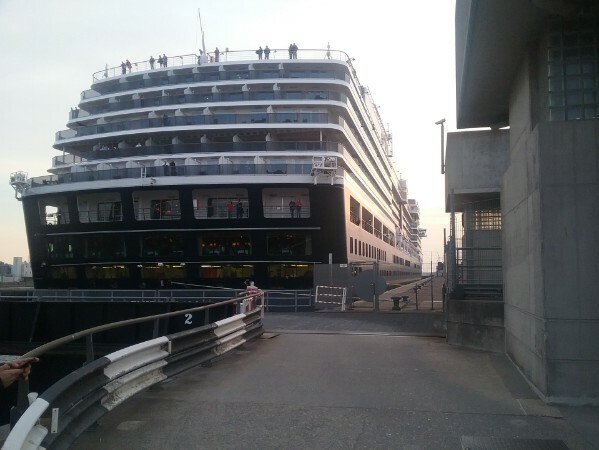 At the 3rd of may 2017, Zuiderdam was the last of the original Vista quadruplets of the Holland America Line to visit the home country. 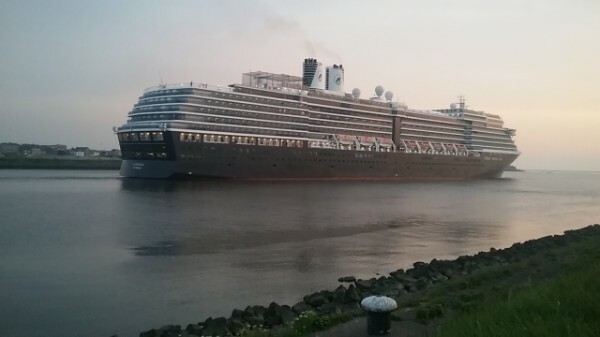 She is seen here passing Velsen Noord on her way to the IJmuiden locks. Although a ship with the name Zuiderdam never sailed for Holland America Line, this ship can still be called 'the second Zuiderdam'. In the early 1940's, Holland America was about to built a series of combiliners for Atlantic service, named after the points of the compass. So the idea of a Vista-class was not new. The ships would become 12.000-tonners and were built at the Wilton-Feijenoord Yards at Rotterdam in The Netherlands. On the 28th of august 1941, a British airraid at the German forces destroyed the half-finished Zuiderdam and she partially burned out. One day later she capsized because of the amount of water that was used to put out the fires, but she was able to be raised and later sank again used as a way to block the port of Rotterdam for allied forces by the Germans. After the war, the company hoped to restore the ship but damage seemed too severe and in april of 1948, the hull was towed to Ghent in Belgium to be scrapped. The other sisters of the class were more fortunate. The Noordam, the second under this name, was built in 1938 and sailed for Holland America Line untill 1963 and the Westerdam sailed between 1946 and 1964. An Oosterdam was never built, though. Mostly also as Holland America Line concentrated on rebuilding the freightfleet after the war and passenger tonnage was adequate throughout the 1940's with the available ships. Between 1946 and 1950, Holland America added at least twenty freightliners to strenghten the fleet. In the 1990's, in a totally different world, the fleet of Holland America Line was only passengerships in the cruisetrade. When the company was taken over by Carnival Corporation in 1989, a new class of four was immidiately ordered. The so called 'S'-class of 55.000-tons was headed by Statendam that entered service in 1992. The ships were modern liners, the first new ships added to the fleet since the 1982/83 twins Noordam and Nieuw Amsterdam. At the moment, also the 1959-built Rotterdam and the 1986-built Westerdam were part of the fleet but the new 'S'-class was really bringing Holland America Line in line with the other companies sailing with larger modern cruiseliners. And the renewal of the fleet did not stop there. Another class of four slightly larger ships was built, the new 60.000-ton Rotterdam in 1997 was the leadship of this 'R'-class. The older ships were phased out of the fleet around the introduction of these ships, that were built to the same profile and lay-out of the S-class. And at the end of the decade, a class of six still larger ships of totally new design was planned. Named the Vista-class, the ships would be 80.000-tonners and become the largest ships ever owned by the line. The lead ship was laid down at the 18th of april of 2001 at the Fincantieri yards in Marghera, Italy. This was the same yards as where the other new classes had been built. Eventually, as the points of the compass would be the influence for the names of the new class, only four were actually added to the Holland America Line fleet. One of the six was cancelled altogether and one was transferred to become Queen Victoria of Cunard Line, but before service even started she became P&O's fourth Arcadia. Built under yardnumber 6075 at the Fincantieri Yards at Monfalcone, Italy, the first ship of a long line but her blueprints were a diversion of the Spirit-class from Carnival/ Costa and she was built to the same hulldesign. The new Holland America Liner measured 81.769 tons and she had a lenght of 285,28 meters, was 32,25 meters wide with a draft of 7,80 meters. She has fifteen decks in total, of which eleven can be used by her passengers. The maximum number of passengers that can be carried is 2272, although commonly the number 1916 is used as a two-per-cabin measure. Some 842 crewmembers are also aboard. The ships's maximum speed is 24 knots, although her servicespeed mostly is 22 knots. 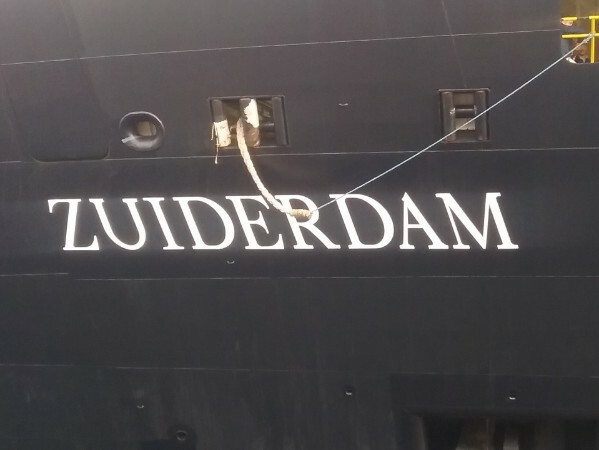 Under the name of Zuiderdam, she floated out of her dock at the 14th of december of 2001 and she was delivered eleven months later at the 15th of november of 2002. Over the next years, her sisters followed swiftly; Oosterdam in 2003, Westerdam in 2004, Arcadia in 2005 and Noordam in 2006. Zuiderdam was a real traditionbreaker for Holland America Line, a company that had always sailed with smaller ships mainly devoted to the classic cruisepassenger in the higher end of the market. As one of the former companies sailing traditional Atlantic lineservices, in style they met Cunard Line, Swedish American Line and HAPAG-Lloyd as examples. With the new Vista-class ships, HAL really tried to also tap into another market. It is too plain to say HAL started to become mass-market like Royal Caribbean or Carnival, but the company definitely started to shift more to the middle. With her five decks of balconycabins, Zuiderdam's appearance was drasticly changed from the earlier ships. Another big change in appearance was the use of two funnels. The last time two funnels were seen on a passengership, was in the Italian liners Raffaelo and Michelangelo from the early 1960's. The reason HAL had chosen for this concept again, was environmental. As HAL was really one of the marketleaders in the precious surroundings of Alaska, the machinery used within the new megaships was expansive. Because of that, it had to be spread out over two enginerooms instead of one, The gas generator and two 12-cylinder engines were to be positioned in the forward engineroom, and the additional three 16-cylinder engines were placed in the aft engineroom. As both enginerooms were to far from eachother, two funnels were simply needed for the exhausts. The engines ran on a combination of diesel and gas, the so-called CODAG and they were directly derived from the engines used aboard Boeing's 767 and 747-400. Another plus with two enginerooms was that they could seperately function too so with an engine breakdown in one, the other engineroom could take over and the ship would still be able to sail. Another change came in the way of propelling the ships as the Vista's were the first within the fleet to be using ABB-designed Azipod outboard motors. Also, Zuiderdam was the first ship in the fleet using dynamic positioning systems, using GPS technology working together with the podsystem and rudder to keep the ship on spot without anchoring. A very visible feature was also the four panoramic elevators rising ten decks along the ships outer sides and they were complimented by ten inside elevators that were totally computer-controlled. As the panorama-elevators also descended down Panorama deck, a painted mural based on pictures of underwater reefs (designed by Dutch artists Mariani Vermeend and Karin Spyker) was used so people could get the impression of diving below the sea inside the elevators when on their way to dacks 1 and 2. A first for the line was the Northern Lights Disco, accessible by a winding corridor with motion-sensitive lighting so people outside the disco would not be bothered by music and lighting. A very extensive Spa with a hydrotherapy pool overseen by a great skylight was also installed, of course not missing massagerooms, a thermal suite and forward gymnasium. Throughout the ship, lighter colours like vibrant orange, yellow and blue were used then aboard the darker, classic earlier ships. It was not always liked by the classic HAL-passenger and even not with the media who were now sure HAL was becoming Carnivalized. But in fact, it settled over the years making clear that with those larger ships HAL simple also had to tap into other markets as the classic, older passenger wasn't going to fill all the new liners and of course new passengers had also be attracted for future growth. HAL simply had to adapt. The ships interriours were designed by the Utrecht-based company VFD, headed by Frans Dingemans so the tradition of Dutch design was not thrown aside. As with all ships in the fleet, Zuiderdam was filled with classic art, but now also complimented with more modern forms. The designers Gilbert Lebigre and his wife Corrine Roger were also approached by VFD again (after they already made art for the older ships) designing murals, ceilings and statues, using their signature Eco-Decor. This is a light-weight, fire-resistant and biodegradable material that was developed by themselves. The main lounge is the Vista Lounge, a massive three-deck space with even room enough for an orchestra pit and a stage with hydraulic risers. Some 867 passengers can enjoy the shows, that are also larger and more contemporate in style then the classic shows usually connected to HAL. After her delivery, Zuiderdam departed for a transatlantic voyage towards Port Everglades, where she was named by American broadcaster Joan Lunden at december 14th 2002 and exactly one year after her floatout. At that moment, she was registered in Willemstad, flying the Dutch flag. This was only changed to her homeport Rotterdam a few days later, at the 30th of december. Her first cruise took her into the Caribbean from Fort Lauderdale and started her normal sailingscedule that is the southern Caribbean in winter and Alaska in summer, between may and september. In may of 2008, the ship was sailing for the Fincantieri Yards at Palermo for a major overhaul and rebuilding of the stern. The stepped-down stern was straightened out so more cabins could be built to the profile of her later sister Noordam. It was kinda sad to see this change as she had definitely been more handsome with her stepped down decks. Now, her tonnage changed to 82.305 and some 1920 (2304) passengers were able to come along. Another rebuilding followed in april of 2015, carried out again in Palermo. Here, more cabins were added so her capacity rose to 1970 (2364) passengers. Of course also her tonnagemeasurement had also changed now, as she was measured at 82.820 tons. 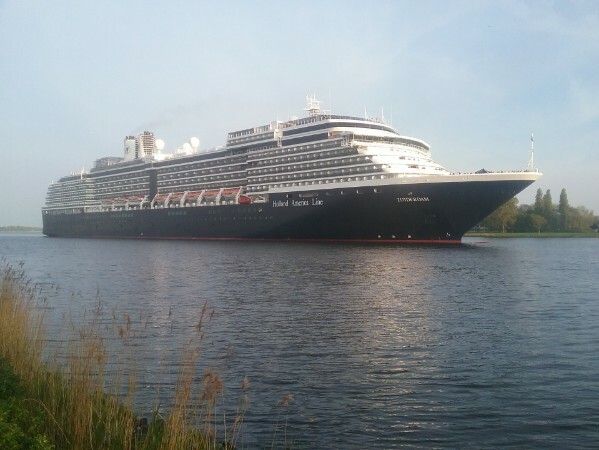 From 2016 onwards, Zuiderdam also started sailing European cruises, changing her common scedule. Gladly, she also started visiting her home-country and that is the reason I was able to add her to the site, completing the Vista sisterhood on castlesoftheseas.